On May 18, 1980, a major volcanic eruption occurred at Mount St. Helens, a volcano located in Skamania County, in the U.S. state of Washington. The eruption (a VEI 5 event) was the most significant volcanic eruption to occur in the contiguous 48 U.S. states since the much smaller 1915 eruption of Lassen Peak in California. It has often been declared the most disastrous volcanic eruption in U.S. history. The eruption was preceded by a two-month series of earthquakes and steam-venting episodes, caused by an injection of magma at shallow depth below the volcano that created a large bulge and a fracture system on the mountain's north slope. An earthquake at 8:32:17 a.m. PDT (UTC−7) on Sunday, May 18, 1980, caused the entire weakened north face to slide away, creating the largest landslide ever recorded. This allowed the partly molten, high-pressure gas- and steam-rich rock in the volcano to suddenly explode northwards toward Spirit Lake in a hot mix of lava and pulverized older rock, overtaking the avalanching face. An eruption column rose 80,000 feet (24 km; 15 mi) into the atmosphere and deposited ash in 11 U.S. states. At the same time, snow, ice and several entire glaciers on the volcano melted, forming a series of large lahars (volcanic mudslides) that reached as far as the Columbia River, nearly 50 miles (80 km) to the southwest. Less severe outbursts continued into the next day, only to be followed by other large, but not as destructive, eruptions later that year. Thermal energy released during the eruption was equal to 26 megatons. Approximately 57 people were killed directly, including innkeeper Harry R. Truman, photographers Reid Blackburn and Robert Landsburg, and geologist David A. Johnston. Hundreds of square miles were reduced to wasteland, causing over $1 billion in damage (equivalent to $3.3 billion today), thousands of animals were killed, and Mount St. Helens was left with a crater on its north side. At the time of the eruption, the summit of the volcano was owned by the Burlington Northern Railroad, but afterward the land passed to the United States Forest Service. The area was later preserved, as it was, in the Mount St. Helens National Volcanic Monument. Mount St. Helens from Monitor Ridge showing the cone of devastation, the huge crater open to the north, the post-eruption lava dome inside and Crater Glacier surrounding the lava dome. The small photo on the left was taken from Spirit Lake before the eruption and the small photo on the right was taken after the eruption from approximately the same place. Spirit Lake can also be seen in the larger image, as well as two other Cascade volcanoes. Mount St. Helens remained dormant from its last period of activity in the 1840s and 1850s until March 1980. Several small earthquakes, beginning on March 15, indicated that magma may have begun moving below the volcano. On March 20, at 3:45 p.m. Pacific Standard Time (all times will be in PST or PDT), a shallow magnitude 4.2 earthquake centered below the volcano's north flank, signaled the volcano's violent return from 123 years of hibernation. A gradually building earthquake swarm saturated area seismographs and started to climax at about noon on March 25, reaching peak levels in the next two days, including an earthquake registering 5.1 on the Richter scale. A total of 174 shocks of magnitude 2.6 or greater were recorded during those two days. Shocks of magnitude 3.2 or greater occurred at a slightly increasing rate during April and May with five earthquakes of magnitude 4 or above per day in early April, and eight per day the week before May 18. Initially there was no direct sign of eruption, but small earthquake-induced avalanches of snow and ice were reported from aerial observations. At 12:36 p.m. on March 27, phreatic eruptions (explosions of steam caused by magma suddenly heating groundwater) ejected and smashed rock from within the old summit crater, excavating a new crater 250 feet (75 m) wide, and sending an ash column about 7,000 feet (2.1 km) into the air. By this date a 16,000-foot-long (3.0 mi; 4.9 km) eastward-trending fracture system had also developed across the summit area. This was followed by more earthquake swarms and a series of steam explosions that sent ash 10,000 to 11,000 feet (3,000 to 3,400 m) above their vent. Most of this ash fell between three and twelve miles (5 and 19 km) from its vent, but some was carried 150 miles (240 km) south to Bend, Oregon, or 285 miles (460 km) east to Spokane, Washington. A second, new crater and a blue flame were observed on March 29. The flame was visibly emitted from both craters and was probably created by burning gases. Static electricity generated from ash clouds rolling down the volcano sent out lightning bolts that were up to two miles (3 km) long. Ninety-three separate outbursts were reported on March 30, and increasingly strong harmonic tremors were first detected on April 1, alarming geologists and prompting Governor Dixy Lee Ray to declare a state of emergency on April 3. Governor Ray issued an executive order on April 30 creating a "red zone" around the volcano; anyone caught in this zone without a pass faced a $500 fine (equivalent to $1,500 today) or six months in jail. This precluded many cabin owners from visiting their property. By April 7, the combined crater was 1,700 by 1,200 feet (520 by 370 m) and 500 feet (150 m) deep. A USGS team determined in the last week of April that a 1.5-mile-diameter (2.4 km) section of St. Helens' north face was displaced outward by at least 270 feet (82 m). For the rest of April and early May this bulge grew by five to six feet (1.5 to 1.8 m) per day, and by mid-May it extended more than 400 feet (120 m) north. As the bulge moved northward, the summit area behind it progressively sank, forming a complex, down-dropped block called a graben. Geologists announced on April 30 that sliding of the bulge area was the greatest immediate danger and that such a landslide might spark an eruption. 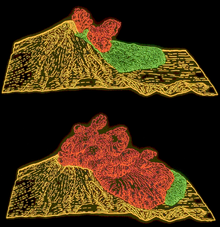 These changes in the volcano's shape were related to the overall deformation that increased the volume of the volcano by 0.03 cubic miles (0.13 km3) by mid-May. This volume increase presumably corresponded to the volume of magma that pushed into the volcano and deformed its surface. 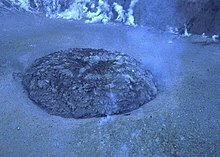 Because the intruded magma remained below ground and was not directly visible, it was called a cryptodome, in contrast to a true lava dome exposed at the surface. On May 7, eruptions similar to those in March and April resumed, and over the next days the bulge approached its maximum size. All activity had been confined to the 350-year-old summit dome and did not involve any new magma. A total of about 10,000 earthquakes were recorded before the May 18 event, with most concentrated in a small zone less than 1.6 miles (2.6 km) directly below the bulge. Visible eruptions ceased on May 16, reducing public interest and consequently the number of spectators in the area. Mounting public pressure then forced officials to allow 50 carloads of property owners to enter the danger zone on Saturday, May 17, to gather whatever property they could carry. Another trip was scheduled for 10 a.m. the next day, and because that was Sunday, more than 300 loggers who would normally be working in the area were not there. By the time of the climactic eruption, dacite magma intruding into the volcano had forced the north flank outward nearly 500 feet (150 m) and heated the volcano's groundwater system, causing many steam-driven explosions (phreatic eruptions). Sequence of events on May 18. Lakes nearest to Mount St. Helens have been partly covered with felled trees for more than thirty years. This photograph was taken in 2012. As May 18 dawned, Mount St. Helens' activity did not show any change from the pattern of the preceding month. The rate of bulge movement, sulfur dioxide emission, and ground temperature readings did not reveal any changes indicating a catastrophic eruption. USGS volcanologist David A. Johnston was on duty at an observation post approximately six miles (10 km) north of the volcano: as of 6:00 a.m., Johnston's measurements did not indicate any unusual activity. At 8:32 a.m., a magnitude 5.1 earthquake centered directly below the north slope triggered that part of the volcano to slide, approximately 7–20 seconds after the shock. The landslide, the largest in recorded history, travelled at 110 to 155 miles per hour (177 to 249 km/h) and moved across Spirit Lake's west arm. Part of it hit a 1,150-foot-high (350 m) ridge about six miles (10 km) north. Some of the slide spilled over the ridge, but most of it moved 13 miles (21 km) down the North Fork Toutle River, filling its valley up to 600 feet (180 m) deep with avalanche debris. An area of about 24 square miles (62 km2) was covered, and the total volume of the deposit was about 0.7 cubic miles (2.9 km3). Scientists were able to reconstruct the motion of the landslide from a series of rapid photographs by Gary Rosenquist, who was camping 11 miles (18 km) away from the blast. Rosenquist, his party and his photographs survived because the blast was deflected by local topography one mile (1.6 km) short of his location. Amateur recording of a series of booms produced by the eruption, as heard from the town of Newport, Oregon (audio filtered and amplified). 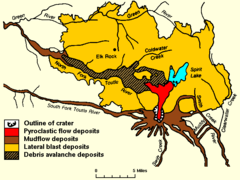 Most of St. Helens' former north side became a rubble deposit 17 miles (27 km) long, averaging 150 feet (46 m) thick; the slide was thickest at one mile (1.6 km) below Spirit Lake and thinnest at its western margin. The landslide temporarily displaced the waters of Spirit lake to the ridge north of the lake, in a giant wave approximately 600 feet (180 m) high. This in turn created a 295 feet (90 m) avalanche of debris consisting of the returning waters and thousands of uprooted trees and stumps. Some of these remained intact with roots, but most had been sheared off at the stump seconds earlier by the blast of super-heated volcanic gas and ash that had immediately followed and overtook the initial landslide. The debris was transported along with the water as it returned to its basin, raising the surface level of Spirit Lake by about 200 ft (61 m). More than three decades after the eruption, floating log mats persist on Spirit Lake and nearby St. Helens Lake, changing position with the wind. The rest of the trees, especially those that were not completely detached from their roots, were turned upright by their own weight and became waterlogged, sinking into the muddy sediments at the bottom where they have become petrified in the anaerobic and mineral-rich waters. This provides insight into other sites with a similar fossil record. The landslide exposed the dacite magma in St. Helens' neck to much lower pressure, causing the gas-charged, partially molten rock and high-pressure steam above it to explode a few seconds after the landslide started. Explosions burst through the trailing part of the landslide, blasting rock debris northward. The resulting blast laterally directed the pyroclastic flow of very hot volcanic gases, ash and pumice formed from new lava, while the pulverized old rock hugged the ground, initially moving at 220 miles per hour (350 km/h) but quickly accelerating to 670 mph (1,080 km/h), and it might have briefly passed the speed of sound. Pyroclastic flow material passed over the moving avalanche and spread outward, devastating a fan-shaped area 23 miles across by 19 miles long (37 km × 31 km). In total about 230 square miles (600 km2) of forest was knocked down, and extreme heat killed trees miles beyond the blow-down zone. At its vent the lateral blast probably did not last longer than about 30 seconds, but the northward-radiating and expanding blast cloud continued for about another minute. Superheated flow material flashed water in Spirit Lake and North Fork Toutle River to steam, creating a larger, secondary explosion that was heard as far away as British Columbia, Montana, Idaho, and Northern California. Yet many areas closer to the eruption (Portland, Oregon, for example) did not hear the blast. This so-called "quiet zone" extended radially a few tens of miles from the volcano and was created by the complex response of the eruption's sound waves to differences in temperature and air motion of the atmospheric layers and, to a lesser extent, local topography. Later studies indicated that one-third of the 0.045 cubic miles (0.19 km3) of material in the flow was new lava, and the rest was fragmented, older rock. Many trees in the Direct blast zone were snapped off at their bases and the earth was stripped and scorched. Direct blast zone, the innermost zone, averaged about eight miles (13 km) in radius, an area in which virtually everything, natural or artificial, was obliterated or carried away. For this reason, this zone also has been called the "tree-removal zone". The flow of the material carried by the blast was not deflected by topographic features in this zone. The blast released energy equal to 24 Megatons of TNT. Channelized blast zone, an intermediate zone, extended out to distances as far as 19 miles (31 km) from the volcano, an area in which the flow flattened everything in its path and was channeled to some extent by topography. In this zone, the force and direction of the blast are strikingly demonstrated by the parallel alignment of toppled large trees, broken off at the base of the trunk as if they were blades of grass mown by a scythe. This zone was also known as the "tree-down zone". Channeling and deflection of the blast caused strikingly varied local effects that still remained conspicuous after some decades. Where the blast struck open land directly, it scoured it, breaking trees off short and stripping vegetation and even topsoil, thereby delaying revegetation for many years. Where the blast was deflected so as to pass overhead by several metres, it left the topsoil and the seeds it contained, permitting faster revegetation with scrub and herbaceous plants, and later with saplings. Trees in the path of such higher-level blasts were broken off wholesale at various heights, whereas nearby stands in more sheltered positions recovered comparatively rapidly without conspicuous long-term harm. Seared zone, also called the "standing dead" zone, the outermost fringe of the impacted area, a zone in which trees remained standing but were singed brown by the hot gases of the blast. 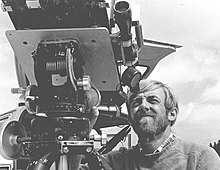 Volcanologist David A. Johnston (photographed on April 4, 1980) was one of the 57 people killed in the eruption. By the time this pyroclastic flow hit its first human victims, it was still as hot as 680 °F (360 °C) and filled with suffocating gas and flying debris. Most of the 57 people known to have died in that day's eruption succumbed to asphyxiation while several died from burns. Lodge owner Harry R. Truman was buried under hundreds of feet of avalanche material. Volcanologist David A. Johnston was one of those killed, as was Reid Blackburn, a National Geographic photographer. Robert Landsburg, another photographer, was killed by the ash cloud. He was able to protect his film with his body, and the surviving photos provided geologists with valuable documentation of the historic eruption. Subsequent outpourings of pyroclastic material from the breach left by the landslide consisted mainly of new magmatic debris rather than fragments of preexisting volcanic rocks. The resulting deposits formed a fan-like pattern of overlapping sheets, tongues and lobes. At least 17 separate pyroclastic flows occurred during the May 18 eruption, and their aggregate volume was about 0.05 cubic miles (0.21 km3). The flow deposits were still at about 570 to 790 °F (300 to 420 °C) two weeks after they erupted. Secondary steam-blast eruptions fed by this heat created pits on the northern margin of the pyroclastic-flow deposits, at the south shore of Spirit Lake, and along the upper part of the North Fork Toutle River. These steam-blast explosions continued sporadically for weeks or months after the emplacement of pyroclastic flows, and at least one occurred a year later, on May 16, 1981. 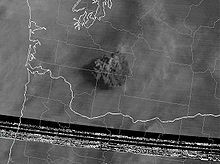 The ash cloud produced by the eruption, as seen from the village of Toledo, Washington, 35 miles (56 km) away, northwest from Mount St. Helens. The cloud was roughly 40 miles (64 km) wide and 15 miles (24 km; 79,000 ft) high. As the avalanche and initial pyroclastic flow were still advancing, a huge ash column grew to a height of 12 miles (19 km; 63,000 ft) above the expanding crater in less than 10 minutes and spread tephra into the stratosphere for 10 straight hours. Near the volcano, the swirling ash particles in the atmosphere generated lightning, which in turn started many forest fires. During this time, parts of the mushroom-shaped ash-cloud column collapsed, and fell back upon the earth. This fallout, mixed with magma, mud, and steam, sent additional pyroclastic flows speeding down St. Helens' flanks. Later, slower flows came directly from the new north-facing crater and consisted of glowing pumice bombs and very hot pumiceous ash. Some of these hot flows covered ice or water which flashed to steam, creating craters up to 65 feet (20 m) in diameter and sending ash as much as 6,500 feet (2,000 m) into the air. Strong high-altitude wind carried much of this material east-northeasterly from the volcano at an average speed of about 60 miles per hour (100 km/h). By 9:45 a.m. it had reached Yakima, Washington, 90 miles (140 km) away, and by 11:45 a.m. it was over Spokane, Washington. A total of four to five inches (100 to 130 mm) of ash fell on Yakima, and areas as far east as Spokane were plunged into darkness by noon where visibility was reduced to 10 feet (3 m) and 0.5 inches (13 mm) of ash fell. Continuing eastward, St. Helens' ash fell in the western part of Yellowstone National Park by 10:15 p.m. and was seen on the ground in Denver, Colorado, the next day. In time, ash fall from this eruption was reported as far away as Minnesota and Oklahoma, and some of the ash drifted around the globe within about two weeks. During the nine hours of vigorous eruptive activity, about 540,000,000 tons (540×10^6 short tons or 490×10^6 t) of ash fell over an area of more than 22,000 square miles (57,000 km2). The total volume of the ash before its compaction by rainfall was about 0.3 cubic miles (1.3 km3). The volume of the uncompacted ash is equivalent to about 0.05 cubic miles (0.21 km3) of solid rock, or about 7% of the amount of material that slid off in the debris avalanche. By around 5:30 p.m. on May 18, the vertical ash column declined in stature, but less severe outbursts continued through the next several days. Residual lateral blast effects in the channelized blast zone, some thirty years after the eruption. Damage ranged from scorched earth, through tree trunks snapped at various heights, to more superficial effects. Generally, given that the way airborne ash is deposited after an eruption is strongly influenced by the meteorological conditions, a certain variation of the ash type will occur, as a function of distance to the volcano or time elapsed from eruption. The ash from Mount St. Helens is no exception, and hence the ash properties have large variations. The bulk chemical composition of the ash has been found to be approximately 65% silicon dioxide, 18% aluminium oxide, 5% ferric oxide, 4% each calcium oxide and sodium oxide and 2% magnesium oxide. Trace chemicals were also detected, their concentrations varying as shown: 0.05–0.09% chlorine, 0.02–0.03% fluorine, and 0.09–0.3% sulfur. The index of refraction, a number used in physics to describe how light propagates through a particular substance, is an important property of volcanic ash. This number is complex having both real and imaginary parts, the real part indicating how light disperses and the imaginary part indicating how light is absorbed by the substance. It is known that the silicate particles have a real index of refraction ranging between 1.5 and 1.6 for visible light. However, there is a spectrum of colors associated with samples of volcanic ash, from very light to dark gray. This makes for variations in the measured imaginary refractive index under visible light. For example, when comparing the imaginary part of the refractive index k of stratospheric ash from 9.3 and 11.2 mi (15 and 18 km) from the volcano it has been discovered that they have similar values around 700 nm (around 0.009), while they differ significantly around 300 nm. Here, the 11.2 mi (18 km) sample (k was found to be around 0.009) was much more absorbent than the 9.3 mi (15 km) sample (k was found to be around 0.002). The hot, exploding material also broke apart and melted nearly all of the mountain's glaciers along with most of the overlying snow. As in many previous St. Helens' eruptions, this created huge lahars (volcanic mudflows) and muddy floods that affected three of the four stream drainage systems on the mountain, and which started to move as early as 8:50 a.m. Lahars travelled as fast as 90 miles per hour (140 km/h) while still high on the volcano but progressively slowed to about three miles per hour (4.8 km/h) on the flatter and wider parts of rivers. Mudflows from the southern and eastern flanks had the consistency of wet concrete as they raced down Muddy River, Pine Creek and Smith Creek to their confluence at the Lewis River. Bridges were taken out at the mouth of Pine Creek and the head of Swift Reservoir, which rose 2.6 feet (0.79 m) by noon to accommodate the nearly 18,000,000 cubic yards (14,000,000 m3) of additional water, mud and debris. Glacier and snow melt mixed with tephra on the volcano's northeast slope to create much larger lahars. These mudflows traveled down the north and south forks of the Toutle River and joined at the confluence of the Toutle forks and the Cowlitz River near Castle Rock, Washington, at 1:00 p.m. Ninety minutes after the eruption, the first mudflow had moved 27 miles (43 km) upstream where observers at Weyerhaeuser's Camp Baker saw a 12-foot-high (4 m) wall of muddy water and debris pass. Near the confluence of the Toutle's north and south forks at Silver Lake, a record flood stage of 23.5 feet (7.2 m) was recorded. A large but slower-moving mudflow with a mortar-like consistency was mobilized in early afternoon at the head of the Toutle River north fork. By 2:30 p.m. the massive mudflow had destroyed Camp Baker, and in the following hours seven bridges were carried away. Part of the flow backed up for 2.5 miles (4.0 km) soon after entering the Cowlitz River, but most continued downstream. After traveling 17 miles (27 km) further, an estimated 3,900,000 cubic yards (3,000,000 m3) of material were injected into the Columbia River, reducing the river's depth by 25 feet (8 m) for a four-mile (6 km) stretch. The resulting 13-foot (4.0 m) river depth temporarily closed the busy channel to ocean-going freighters, costing Portland, Oregon, an estimated five million US dollars (equivalent to $15.2 million today). Ultimately, more than 65 million cubic yards (50 million cubic metres; 1.8 billion cubic feet) of sediment were dumped along the lower Cowlitz and Columbia Rivers. The May 18, 1980, event was the most deadly and economically destructive volcanic eruption in the history of the contiguous United States. Approximately fifty-seven people were killed directly from the blast and 200 houses, 47 bridges, 15 miles (24 km) of railways and 185 miles (298 km) of highway were destroyed; two people were killed indirectly in accidents that resulted from poor visibility, and two more suffered fatal heart attacks from shoveling ash. U.S. President Jimmy Carter surveyed the damage and said it looked more desolate than a moonscape. More than 4,000,000,000 board feet (9,400,000 m3) of timber was damaged or destroyed, mainly by the lateral blast. At least 25% of the destroyed timber was salvaged after September 1980. Downwind of the volcano, in areas of thick ash accumulation, many agricultural crops, such as wheat, apples, potatoes and alfalfa, were destroyed. As many as 1,500 elk and 5,000 deer were killed, and an estimated 12 million Chinook and Coho salmon fingerlings died when their hatcheries were destroyed. Another estimated 40,000 young salmon were lost when they swam through turbine blades of hydroelectric generators after reservoir levels were lowered along the Lewis River to accommodate possible mudflows and flood waters. In total, Mount St. Helens released 24 megatons of thermal energy, seven of which were a direct result of the blast. This is equivalent to 1,600 times the size of the atomic bomb dropped on Hiroshima. There is a minor controversy in regard to the exact death toll. The figure most commonly cited is fifty-seven. However, there are two points of dispute. The first point regards two officially listed victims, Paul Hiatt and Dale Thayer. They were reported missing after the explosion. In the aftermath, investigators were able to locate individuals named Paul Hiatt and Dale Thayer who were alive and well. However, they were unable to determine who reported Hiatt missing, and the person who was listed as reporting Thayer missing claimed she wasn't the one who had done so. Since the investigators could not thus verify that they were the same Hiatt and Thayer who were reported missing, the names remain listed among the presumed dead. The second point regards three missing people who are not officially listed as victims: Robert Ruffle, Steven Whitsett and Mark Melanson. Cowlitz County Emergency Services Management lists them as "Possibly Missing — Not on [the official] List". According to Melanson's brother, in October 1983, Cowlitz County officials told his family that Melanson "is believed [...] a victim of the May 18, 1980, eruption" and that after years of searching, the family eventually decided "he's buried in the ash". Taking these two points of dispute into consideration, the direct death toll could be as low as fifty-five or as high as sixty. When combined with the four indirect victims mentioned earlier, those numbers range from fifty-nine to sixty-four. The ash fall created some temporary major problems with transportation, sewage disposal, and water treatment systems. Visibility was greatly decreased during the ash fall, closing many highways and roads. Interstate 90 from Seattle to Spokane was closed for a week and a half. Air travel was disrupted for between a few days and two weeks, as several airports in eastern Washington shut down because of ash accumulation and poor visibility. Over a thousand commercial flights were cancelled following airport closures. Fine-grained, gritty ash caused substantial problems for internal-combustion engines and other mechanical and electrical equipment. The ash contaminated oil systems and clogged air filters, and scratched moving surfaces. Fine ash caused short circuits in electrical transformers, which in turn caused power blackouts. Removing and disposing of the ash was a monumental task for some Eastern Washington communities. State and federal agencies estimated that over 2,400,000 cubic yards (1,800,000 m3) of ash, equivalent to about 900,000 tons in weight, were removed from highways and airports in Washington. The ash removal cost $2.2 million and took 10 weeks in Yakima. The need to remove ash quickly from transport routes and civil works dictated the selection of some disposal sites. Some cities used old quarries and existing sanitary landfills; others created dump sites wherever expedient. To minimize wind reworking of ash dumps, the surfaces of some disposal sites were covered with topsoil and seeded with grass. In Portland, Oregon, the mayor eventually threatened businesses with fines if they failed to remove the ash from their parking lots. A refined estimate of $1.1 billion ($3.4 billion as of 2018[update]) was determined in a study by the International Trade Commission at the request of the United States Congress. A supplemental appropriation of $951 million for disaster relief was voted by Congress, of which the largest share went to the Small Business Administration, U.S. Army Corps of Engineers and the Federal Emergency Management Agency. There were also indirect and intangible costs of the eruption. Unemployment in the immediate region of Mount St. Helens rose tenfold in the weeks immediately following the eruption, and then returned to near-normal levels once timber-salvaging and ash-cleanup operations were underway. Only a small percentage of residents left the region because of lost jobs owing to the eruption. Several months after May 18, a few residents reported suffering stress and emotional problems, even though they had coped successfully during the crisis. Counties in the region requested funding for mental health programs to assist such people. Initial public reaction to the May 18 eruption dealt a nearly crippling blow to tourism, an important industry in Washington. Not only was tourism down in the Mount St. Helens–Gifford Pinchot National Forest area, but conventions, meetings and social gatherings also were cancelled or postponed at cities and resorts elsewhere in Washington and neighboring Oregon not affected by the eruption. The adverse effect on tourism and conventioneering, however, proved only temporary. Mount St. Helens, perhaps because of its reawakening, has regained its appeal for tourists. The United States Forest Service and the State of Washington opened visitor centers and provided access for people to view the volcano's devastation. 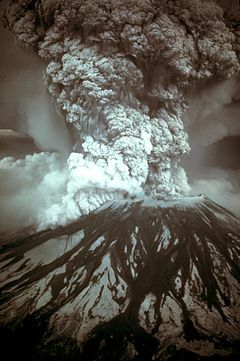 St. Helens produced an additional five explosive eruptions between May and October 1980. Through early 1990, at least twenty-one periods of eruptive activity had occurred. The volcano remains active, with smaller, dome-building eruptions continuing into 2008. An eruption occurred on May 25, 1980, at 2:30 a.m. that sent an ash column nine miles (48,000 ft; 14 km) into the atmosphere. The eruption was preceded by a sudden increase in earthquake activity and occurred during a rainstorm. Erratic wind from the storm carried ash from the eruption to the south and west, lightly dusting large parts of western Washington and Oregon. Pyroclastic flows exited the northern breach and covered avalanche debris, lahars and other pyroclastic flows deposited by the May 18 eruption. At 7:05 p.m. on June 12, a plume of ash billowed 2.5 miles (13,000 ft; 4.0 km) above the volcano. At 9:09 p.m. a much stronger explosion sent an ash column about 10 miles (53,000 ft; 16 km) skyward. This event caused the Portland area, previously spared by wind direction, to be thinly coated with ash in the middle of the annual Rose Festival. A dacite dome then oozed into existence on the crater floor, growing to a height of 200 feet (61 m) and a width of 1,200 feet (370 m) within a week. A series of large explosions on July 22 broke more than a month of relative quiet. The July eruptive episode was preceded by several days of measurable expansion of the summit area, heightened earthquake activity, and changed emission rates of sulfur dioxide and carbon dioxide. The first hit at 5:14 p.m. as an ash column shot 10 miles (53,000 ft; 16 km) and was followed by a faster blast at 6:25 p.m. that pushed the ash column above its previous maximum height in just 7.5 minutes. The final explosion started at 7:01 p.m. and continued for over two hours. When the relatively small amount of ash settled over eastern Washington, the dome built in June was gone. Seismic activity and gas emission steadily increased in early August, and on August 7 at 4:26 p.m., an ash cloud slowly expanded 8 miles (42,000 ft; 13 km) into the sky. Small pyroclastic flows came through the northern breach and a weaker outpouring of ash rose from the crater. This continued until 10:32 p.m. when a second large blast sent ash high into the air, proceeding due north. A second dacite dome filled this vent a few days later. Two months of repose were ended by an eruption lasting from October 16 to 18. This event obliterated the second dome, sent ash 10 miles (53,000 ft; 16 km) in the air and created small, red-hot pyroclastic flows. A third dome began to form within 30 minutes after the final explosion on October 18, and within a few days, it was about 900 feet (270 m) wide and 130 feet (40 m) high. In spite of the dome growth next to it, a new glacier formed rapidly inside the crater. All of the post-1980 eruptions were quiet dome-building events, beginning with the December 27, 1980, to January 3, 1981, episode. By 1987 the third dome had grown to be more than 3,000 feet (910 m) wide and 800 feet (240 m) high. Further eruptions occurred over a few months between 1989 and 1991. The 2004–08 volcanic activity of Mount St. Helens has been documented as a continuous eruption with a gradual extrusion of magma at the Mount St. Helens volcano. Starting in October 2004, there was a gradual building of a new lava dome. The new dome did not rise above the caldera created by the 1980 eruption. This activity lasted until January 2008. 27 bridges, nearly 200 homes. Blast and lahars destroyed more than 185 mi (298 km) of highways and roads and 15 mi (24 km) of railways. Reduced carrying capacity at flood stage at Castle Rock from 76,000 cu ft (2,200 m3) per second to less than 15,000 cu ft (420 m3) per second. The Washington State Department of Game estimated nearly 7,000 big game animals (deer, elk and bear) perished as well as all birds and most small mammals. Many burrowing rodents, frogs, salamanders and crawfish managed to survive because they were below ground level or water surface when the disaster struck. The Washington Department of Fisheries estimated that 12 million Chinook and Coho salmon fingerlings were killed when hatcheries were destroyed. Another estimated 40,000 young salmon were lost when forced to swim through turbine blades of hydroelectric generators as reservoir levels along the Lewis River were kept low to accommodate possible mudflows and flooding. Brantley and Myers, 1997, Mount St. Helens – From the 1980 Eruption to 1996: USGS Fact Sheet 070–97, accessed 2007-06-05; and Tilling, Topinka, and Swanson, 1990, Eruption of Mount St. Helens – Past, Present, and Future: USGS General Interest Publication, accessed 2007-06-05. Cascade Volcanoes — High Cascades. The Eruption of Mount St. Helens! (1980 film) — documentary movie about the eruption. This article incorporates public domain material from the United States Geological Survey document: "Eruptions of Mount St. Helens: Past, Present, and Future". Retrieved December 5, 2010. ^ Fisher, Heiken & Hullen (1998), p. 294. ^ Harden, Blaine (May 18, 2005). "Explosive Lessons of 25 Years Ago". The Washington Post. p. A03. Retrieved February 8, 2015. ^ "Mount Saint Helens Eruption - giph.io". giph.io. Archived from the original on September 26, 2017. Retrieved September 25, 2017. ^ "Those who lost their lives because of the May 18, 1980 eruption of Mount St. Helens" (PDF). KGW news. Archived from the original (PDF) on May 25, 2009. ^ a b c d e f g h i j k l m n o p q r s t u v w x y z aa ab ac ad ae af ag ah ai aj ak al Tilling, Robert I.; Topinka, Lyn & Swanson, Donald A. (1990). "Eruptions of Mount St. Helens: Past, Present, and Future". The Climactic Eruption of May 18, 1980. U.S. Geological Survey (Special Interest Publication). Archived from the original on October 26, 2011. Retrieved December 5, 2010. (adapted public domain text). ^ Gorney, Cynthia (March 31, 1980). "The Volcano: Full Theater, Stuck Curtain; Hall Packed for Volcano, But the Curtain Is Stuck". The Washington Post. ^ a b "Mount St. Helens Precursory Activity: March 15–21, 1980". USGS. 2001. Archived from the original on October 6, 2012. ^ a b c d Harris, Fire Mountains of the West (1988), p. 202. ^ Ray, Dewey (March 27, 1980). "Oregon volcano may be warming up for an eruption". Christian Science Monitor. Archived from the original on June 29, 2012. Retrieved October 31, 2010. ^ a b "Mount St. Helens Precursory Activity: March 22–28, 1980". United States Geological Survey. 2001. Archived from the original on October 5, 2012. Retrieved June 6, 2015. ^ "Mount St. Helens blows its top". Lewiston Morning Tribune. (Idaho). Associated Press. March 28, 1980. p. 1A. ^ Rose, Robert L. (March 28, 1980). "Washington volcano blowing its top". Spokesman-Review. (Spokane, Washington). p. 1. ^ Blumenthal, Les (March 29, 1980). "Hot volcanic ash moves lower". Spokane Daily Chronicle. (Washington). Associated Press. p. 1. ^ a b c Harris, Fire Mountains of the West (1988), p. 204. ^ a b c d Harris, Fire Mountains of the West (1988), p. 203. ^ a b "Mount St. Helens Precursory Activity: March 29 – April 4, 1980". United States Geological Survey. 2001. Archived from the original on October 10, 2012. Retrieved June 6, 2015. ^ "Hazard zones created around mountain". Spokesman-Review. (Spokane, Washington). Associated Press. May 1, 1980. p. 8. ^ a b "Volcano bulge grows". Spokane Daily Chronicle. (Washington). UPI. May 2, 1980. p. 6. ^ "Mount St. Helens cabin owners angry at ban". Spokane Daily Chronicle. (Washington). wire services. May 17, 1980. p. 1. ^ "Mount St. Helens Precursory Activity: April 5–11, 1980". United States Geological Survey. 2001. Archived from the original on October 11, 2012. Retrieved June 6, 2015. ^ "St. Helens: Huge hunk of mountain could still hit lake". Lewiston Morning Tribune. (Idaho). Associated Press. April 29, 1980. p. 3B. ^ a b "Reawakening and Initial Activity". United States Geological Survey. 1997. Archived from the original on June 9, 2007. Retrieved May 31, 2007. ^ "Mount St. Helens Precursory Activity: May 3–9, 1980". USGS. 2001. Archived from the original on February 3, 2013. Retrieved May 26, 2007. ^ a b c "Mount St. Helens Precursory Activity: May 10–17, 1980". United States Geological Survey. 2001. Archived from the original on March 12, 2010. Retrieved June 6, 2015. ^ a b "Homes near volcano checked". Eugene Register-Guard. (Oregon). Associated Press. May 18, 1980. p. 6A. ^ a b c d e Harris, Fire Mountains of the West (1988), p. 205. ^ Fisher, Heiken & Hullen (1998), p. 117. ^ a b c d e f Harris, Fire Mountains of the West (1988), p. 209. ^ Fritz, William, J.; Harrison, Sylvia (1985). "Transported trees from the 1982 Mount St. Helens sediment flows: Their use as paleocurrent indicators". Sedimentary Geology (Scientific). 42 (1, 2): 49–64. doi:10.1016/0037-0738(85)90073-9. ^ a b c d e f Harris, Fire Mountains of the West (1988), p. 206. ^ Robert Coenraads (2006). "Natural Disasters and How We Cope", p.50. Millennium House, ISBN 978-1-921209-11-6. ^ a b c Harris, Fire Mountains of the West (1988), p. 208. ^ "Cloud of ash soaring over Kentucky". Eugene Register-Guard. (Oregon). Associated Press. May 20, 1980. p. 5A. ^ a b Harris, Fire Mountains of the West (1988), p. 210. ^ a b c Taylor, H. E.; Lichte, F. E. (1980). "Chemical composition of Mount St. Helens volcanic ash". Geophysical Research Letters. 7 (11): 949–952. doi:10.1029/GL007i011p00949. ^ a b Patterson, E. M. (1981). "Measurement of the Imaginary Part of the Refractive Index Between 300 and 700 Nanometers for Mount St. Helens Ash". Science. 211 (4484): 836–838. doi:10.1126/science.211.4484.836. PMID 17740398. ^ "What were the effects on people when Mt St Helens erupted?". Oregon State University. Retrieved November 7, 2015. ^ Patty Murray (May 17, 2005). "25th Anniversary of the Mount St. Helens Eruption". Congressional Record – Senate. U.S. Government Printing Office. pp. S5252. Retrieved May 18, 2009. ^ Egan, Timothy (June 26, 1988). "Trees Return to St. Helens, But Do They Make a Forest?". The New York Times. p. 1. Retrieved May 18, 2009. ^ Michael Lienau. "To Touch a Volcano: A Filmmaker's Story of Survival". Global Net Productions. Archived from the original on May 29, 2011. Retrieved May 19, 2009. ^ a b c d e Harris, Fire Mountains of the West (1988), p. 211. ^ "Mount St. Helens – From the 1980 Eruption to 2000, Fact Sheet 036-00". U.S. Geological Survey. Archived from the original on May 12, 2013. Retrieved July 6, 2009. ^ Slape, Leslie (April 22, 2005). "Mountain Mystery: Some wonder if fewer people died in 1980 eruption". The Daily News. Longview, Washington. Retrieved December 10, 2015. ^ a b "Mt. St Helens Victims". The Columbian. Retrieved December 10, 2015. ^ Painter, John Jr. The 1980s. The Oregonian, December 31, 1989. ^ As calculated using "Inflation Calculator". Retrieved June 12, 2018. ^ a b c d Harris, Fire Mountains of the West (1988), p. 212. ^ "He Remembers the Year the Mountain Blew (1980)". The Oregonian. Archived from the original on August 29, 2012. Retrieved January 28, 2008. ^ a b c d e Harris, Fire Mountains of the West (1988), p. 213. Fisher, R.V. ; Heiken, G.; Hulen, J. (1998). Volcanoes: Crucibles of Change. Princeton University Press. ISBN 978-0-691-00249-1. Harris, Stephen L. (1988). Fire Mountains of the West: The Cascade and Mono Lake Volcanoes. Missoula, MT: Mountain Press Publishing Company. ISBN 978-0-87842-220-3. Klimasauskas, Ed (May 1, 2001). "Mount St. Helens Precursory Activity". United States Geological Survey. Archived from the original on October 6, 2012. Retrieved June 6, 2015. Topinka, Lyn. "Mount St. Helens: A General Slide Set". Cascades Volcano Observatory, U.S. Geological Survey. Archived from the original on December 18, 2007. Retrieved May 10, 2007. Findley, Rowe (December 1981). "Mount St. Helens Aftermath". National Geographic. Vol. 160 no. 6. pp. 713–733. ISSN 0027-9358. OCLC 643483454. 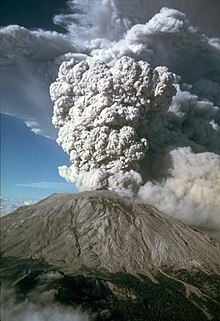 Wikimedia Commons has media related to 1980 eruption of Mount St. Helens. "Mt. St. Helens Volcano Victims". I Dream of Genealogy. Archived from the original on May 27, 2007. Retrieved December 15, 2004.